When I began my initial marathon of Psych, I found myself immediately compelled by the character of Shawn Spencer. He was a smidge smarmy, definitely smug, and had a kind of sarcastic and biting wit that reminded me of my favorite television characters. But what really interested me from the beginning about Shawn was that there was a part of him that just bubbled beneath the surface who wasn't a slacker or a dreamer or immature, but someone who was angry. We see hints of Shawn's bitterness in the pilot episode and never more so than when he interacts with his father, Henry. And I really loved that trait. It made me interested in his story. Because the truth of the matter is that when you're a main character in a new series, you need to not only be interesting, but also layered. There needs to be an air of mystery surrounding you so that you will not just engage an audience for forty-odd minutes but will compel them to return week after week to watch your journey unfold. In the pilot for Psych, it would have been easy to construct a lazy slacker with far-fetched ideas and zero ambitions or a moral compass. But Shawn Spencer... well, he wasn't a just: he wasn't JUST a slacker -- there was more to his story. He wasn't JUST a liar -- it is far too easy to label him as such. He isn't JUST an adult who never grew up -- he's grown up in many undesirable ways. No, Shawn Spencer intrigued me when I initially started the series and upon re-watching it, he's intrigued me even more. In the pilot episode of the series, he's a man who uses his gift of extreme perception in order to gain what he wants and -- also -- in order to avoid his consequences. But he's more than that. He's someone who genuinely wants to use the talents that he's been gifted with to do something he's actually passionate about. As he tells Henry in the episode, he's actually GOOD at police work because of his memory and it's the first time in the entire episode in which we see Shawn really express his genuine passion for something. Shawn is kind of aimless when we first meet him. He's content to coast with his romantic relationships and his familial ones. He's content to literally coast from job to job, as Gus -- his best friend -- notes. Shawn isn't the kind of guy who likes to commit to just one thing, be it person or career, because I think there's a part of Shawn that is just so scared of being STUCK. And so, he keeps moving. And as long as Shawn keeps moving, he doesn't have to think about his life too much. He doesn't have to worry about working on mending relationships, like the one between him and his father. But in the pilot, once Shawn becomes a consultant, of sorts, for interim chief of police Karen Vick on a case, we see something interesting: we see Shawn's conscious decision NOT to coast. He doesn't take his check and ride away with it like I presume he's done many times before in many situations before. He can't stop thinking about the case. And it's more than just the fact that Shawn is good at what he does -- he's actually found a way to combine his talents and his dreams in a realistic way. There's only one snafu in Shawn's plan: he's technically lying to everyone. You see, Psych -- much like its USA drama counterpart Suits -- is about a guy who has a secret and spends the duration of the series desperately trying to keep that secret from others. In Shawn's case, the lie that he tells everyone at the Santa Barbara Police Department is that he's a psychic. And he tells this lie in order to avoid getting thrown into jail (because he's tipped off the police about suspects in the past and they're convinced he's the one behind the crimes). So when Shawn excitedly tells his father that he's good at police work, Henry's first response is to remind Shawn that he's lying to everyone and eventually, he'll get caught. And he'll be in a world of trouble, then. Gus reminds Shawn of this frequently, too, but Shawn brushes them both off. Shawn is excited, you see, because he's finally found something that he's good at. Part of the reason why Shawn coasts in his life, I think, is because he gets bored. And the second he gets bored, he moves onto something that will provide him with momentary fulfillment... until THAT bores him and he moves on again. As long as he keeps moving and bouncing from person to person or job to job, there's no time for boredom. No time to contemplate his life. No time to remember that he's a grown man and is still not settled down. The idea of settling down anywhere -- of not having the freedom to just cut and run when things are difficult -- scares Shawn. And I think a lot of the behavior we see in the pilot and beyond is due to his strained relationship with his father. Oh, man, I could write a novel about how much the Henry/Shawn relationship evolves throughout the series, but I'll refrain and instead note that re-watching the pilot and seeing how fractured the relationship between Shawn and his father was, was so painful but so good. Shawn blamed his father for a lot of things and that bitterness and anger within him is why I was so drawn to Shawn Spencer in the first place. He's not just the guy who cuts and runs. He's not just a man-child. He's a person who took care of his mother when his parents divorced. He's a person who had a strained relationship with his father growing up and blames him -- Henry -- for the person he became. Shawn blames Henry for making him bitter, for making him into what he became. And yet, Shawn refuses to deal with that pain. He doesn't even know his father moved back to town and was living in their childhood home. Because it's much easier for Shawn to keep his father at a distance and blame him for the way he turned out than it is to own up to his OWN mistakes and behavior. But make no mistake about it: Shawn DOES confront his dad. He's the one who shows up at his father's house. He's the one who asks for help on the case. Even though their relationship is broken and tinged with a whole lot of anger and a whole lot of tension, Shawn still manages to take a bold step and confront his father instead of turning and running away. It's this really interesting duality, right? This idea that Shawn doesn't want his father in his life because he blames him for so many things and yet Shawn is also so prideful that he cannot approach Henry for assistance. Henry, too, is such an interesting character in the pilot. You can tell that he is angry. He's angry and disappointed in the person Shawn became (a person Shawn blames his father for becoming, honestly). And that disappointment isn't just limited to adulthood -- Shawn believes his father has ALWAYS been disappointed in him and carries the pain of that into his adult life. Henry astutely notes that Shawn is flighty: that he doesn't like settling onto a project and has passion for it for a moment before deciding to call it quits. But Shawn is insistent in the pilot that he's found a way to use his gift not just to help people but in a way that he can have FUN while doing so. "Fun" is what Shawn has always been good at. But "sensible" is what his best friend Gus has always been good at. We meet Burton "Gus" Guster, Shawn's best friend, in the pilot, too. He's logical and holds a steady job. I love Gus because he's the kind of character who is automatically assigned the role of "the straight man" but eventually becomes so much more than that (much like Ben Wyatt does in Parks and Recreation). Gus isn't without his flaws, really, and one of his preliminary ones is that he never takes risks. He has structure and order and plans and he remains unhappy because he's logical and rational. To him, having a five-year plan is better than what Shawn does and in many ways, Gus is right: having a steady source of income and being dependable and reliable IS something to be commended. Where Shawn is flighty, Gus is grounded. Where Shawn takes risks, Gus analyzes them. Shawn needs someone like Gus because without him, bills wouldn't get paid and there would never be any groceries. But Gus needs Shawn, too. And I think that's one of the things that we get to see most throughout the course of the series -- Shawn may need Gus's reliable and dependable nature, his gentle and rational persona, and his car... but Gus needs Shawn, too. He needs Shawn to force him to have adventures and be braver. Gus has potential and Shawn has always been able to see that potential. He sees MORE in Gus than just a pharmaceutical sales rep. He sees someone who has dreams, and Gus has always been too afraid to fail to even reach for those dreams slightly. So Gus decides to embark on an adventure with Shawn -- one adventure -- in the pilot episode: the duo get called upon to solve a kidnapping and between the two of them, they're able to do so and earn credibility with the Santa Barbara Police Department. Shawn then decides that they are going to set up shop as consulting psychic detectives and though Gus is convinced (throughout the entire series, really) that everything Shawn does is a horrible idea, he still takes part in that adventure with him. The Psych pilot is so delightful not because it is perfect (it's definitely not as funny as the episodes that follow), and certainly not because its characters are perfect. The pilot is delightful because the characters are flawed, zany, and wonderful. 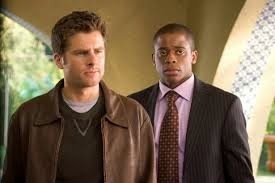 Everyone is dealing with growing up on the series and though Psych is a lighthearted adventure, it also occasionally pokes at the bigger question: is Shawn a bad person for lying to the people he works with if he's saving lives and solving crimes in the process? Because Shawn Spencer is right in the pilot -- he is very good at what he does and he manages to help people while also having the freedom (by opening his own agency) to be his own boss and to call the shots and to -- essentially -- play "grown-up" with his best friend. Make no mistake about it, though: Shawn quickly learns that his actions at Psych and the Santa Barbara Police Department have consequences, not just for himself but for the people he's brought into his lie (including Henry). And even though Shawn enjoys playing detective in the pilot, it's sweet and ironic that eventually throughout the series, Shawn just stops PLAYING detective and becomes as good and as valuable as one. He tones down his "psychic visions." He embraces the idea that he's not always right. He learns to trust and rely on other people. He starts to mend his relationship with his father. He becomes more grounded and rational (while still managing to be that pop culture-loving, snappy Shawn we met in the pilot). Shawn Spencer grows, even in the pilot episode, and it's endearing to see a character like that -- a character who is genuinely intelligent, passionate, and deeply flawed as the main character of Psych. Shawn initially drew me into Psych, but it was the wit, humor, heart and genuine stakes of the series (a series ALWAYS needs to have stakes to work) that kept me coming back for more. I know it's because it's 2006, but James Roday looks like such a baby in the pilot! I'm constantly reminded of how young he was and how pilot episodes are always so much different than the rest of the series. "How many hats are in the room?" Still one of my favorite moments in the series and especially when it gets called back to at the very end of the show, too. "Don't you try to trivialize police work." "You're doing a bang-up job of that yourselves." "What I need is a miracle. Or a facsimile of one." I nearly forgot that McNab has been with the series since the pilot! "I need you to write stuff down. Because you know how I zone out when other people talk." "My very first case and I'm already being threatened. Wow." "What's your dental plan?" "Don't get cavities." "Health plan?" "Same, but with hepatitis and shingles." First appearance of the pineapple during the scene at Gus's place, YAY. I'm going to see if I can spot where it is every episode during my re-watch. Well, folks, there you have it! So I've decided that since I was so enamored by this show during my first marathon of it, I would re-watch it and write about it. Here's how the reviews will work: I won't review EVERY episode individually, unless it's a really important episode (like season finales or premieres or special episodes) because there are some episodes that I don't have a lot to write about. I'll probably try to compact it so there are at least 3-4 episodes in one post/review so that way we can progress throughout the series. Even though there are only approximately 15 episodes per season (plus the musical), they're each 42 minutes long so there's a decent amount of content to talk about. Hopefully you guys stick around and marathon through with me! I'll marathon as I am able to and time allows (with all of the currently airing primetime shows that will need to be reviewed on here that may be a bit tricky but I will try to make it work), and I would love for you all -- especially those who've never watched the series -- to join me. The eighth and final season of Psych will be released on Netflix this coming week which means you guys have no excuse! Watch it. Ah, Psych. I loved that show. I was a late comer to it as well. I think I started watching old episodes in 2010. This is an excellent reason to rewatch. I'm in! YAY! Welcome to the party, Becca! I somehow just fell into "Psych" this summer and watched the entire series on Netflix (primarily). My regret is that I never got into the show when it was actually on the air. Ugh. There are so many great shows I got into late or after they were done. I've lived abroad so long that I feel that is how I come to a lot of the US shows of the last decade. It makes for a different viewing experience certainly. I think about experiencing Buffy from the start and getting really involved with other fans. It's different when you can watch 5 or 6 seasons all in one go. Makes it easier on the impatient ones like me :) Thank heavens for online resources so we can find them when we find them and not have to rely on syndication.